Need Pet Pantry Assistance? Perhaps you want to donate something to our pantry? If you are interested in receiving pet pantry assistance please fill out the documents below and either email them to Julie at k9safeathome44@gmail.com or bring them with you to your appointment at the pantry. You can fill these documents out at the pantry (and we do have copies), but if you would like your visit to go more quickly then you can fill them out prior. We are always available if you have any questions. The pantry assistance document will be good for 90 days, and after the 90 days we will re-evaluate your needs. Interested in being a part of K9 Safe at Home but feel that you live to far away? How about helping the people in need in your own town by holding approximately 10 bags of food at a time and distributing them when needed? If interested in helping out in this way please contact us! 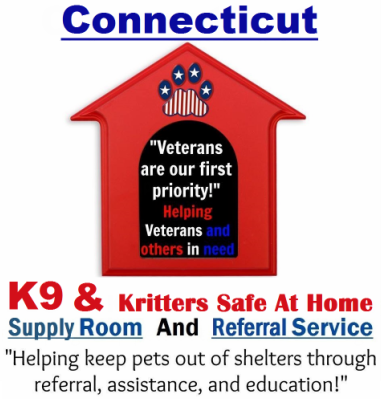 If you are interested in making a donation in person to our pantry or are interested in having a volunteer pick some donations up, please fill out the document below and email it to Julie at k9safeathome44@gmail.com . This will allow us to not only send you a "Thank You" note, but if you need items picked up it will allow us to know what address we are going to be meeting to pick up any donations.